Blue Whale for Kids: Learn about the giant mammal. Blue whales are by far the biggest animals in the world. Even the biggest dinosaur that ever lived doesn't come close in size to the blue whale. The blue whale is a type of mammal called a cetacean and is a type of baleen whale. The scientific name for the blue whale is the Balaenoptera muscolus. Blue whales live in every one of the oceans of the world. They feed in high latitudes and migrate to the tropics to breed and give birth. To eat, blue whales filter their food through stiff, bony, comb-like teeth called baleen plates. Their main diet is krill (euphausiids) and copepods. A blue whale can eat up to 8,000 lbs. of krill a day during its peak consumption period. It is estimated to take 2,200 lbs. of food to fill a blue whale's stomach. Blue whales are simply enormous. A blue whale heart is the size of a small car and pumps 10 tons of blood through the massive blue whale body. A blue whale aorta (the main blood vessel) alone is large enough for a human to crawl through. In the Antarctic, blue whales have reportedly reached lengths of 110 feet, but most probably grow to between 80 and 90 feet long. They can weigh over 200 tons or 400,000 pounds! 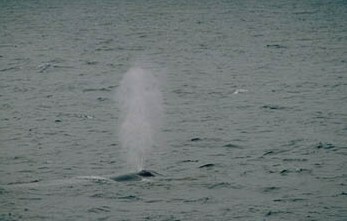 Female blue whales are generally larger than males, and northern hemisphere blue whales are generally smaller than those in the southern hemisphere. 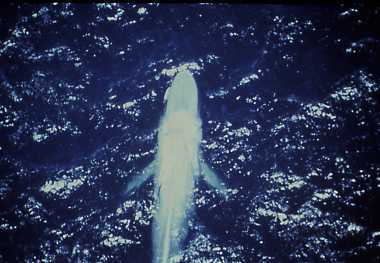 Blue whales are light bluish gray on their dorsal side and mottled gray whitish on their bellies. Some have yellowish bellies. A baby blue whale is called calf. When the baby is born it is as large as an elephant and grows very quickly. It will gain around 200 pounds a day and be about 50 feet long at the age of 6 months. Wow! A baby blue whale will live off its mother's milk for the first 6 months, at which point it will have grown its baleen plates so it can eat krill. The blue whale is also the loudest animal on the planet. Scientists do not know why blue whales sing, but they do know that they sing loudly. A typical blue whale call will last for 10 to 30 seconds and is a very low frequency sound between 10 and 40 Hz. This means that you may not be able to even hear this "loud" whale call, as most humans can only hear down to around 20Hz. 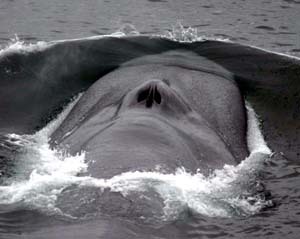 The worldwide blue whale population is not known, however, blue whales are considered endangered according to the U.S. Endangered Species Act. It is thought that the current population is between 5,000 and 12,000 blue whales. For many years blue whales were hunted extensively for their large quantities of baleen, blubber, and meat. Although blue whales are protected, their populations show few signs of recovery. When blue whales exhale out their blowhole, the water they blow can go 30 feet high. They can travel thousands of miles each year as they migrate. They are usually found alone or in small groups. They have a lifespan of around 80 to 90 years.